When you mention stillwater nymphing to a group of fly fishermen, you can’t expect more than a quarter of the group to stick around. Certainly, it’s not for everyone. It just happens that a lake offered my most productive fly fishing day ever entre into the sport. After the drive over Tioga Pass last month, the plan was for Willy, Bill and me to spend that Wednesday with a guide, learning the specifics and generalities of Crowley Lake. Learn we did. Catching, not so much. The high water this year had the Los Angeles Department of Water & Power monkeying around with the lake level, which, combined with warmer-than-usual fall weather, led to heavy weed growth. Not only were weeds growing up from the bottom, algae floated on top. We’d be parking the boat over a channel created by McGee Creek in search of a literal window through which we might present our flies. Doug would be more than our guide that day. He would be teacher and cheerleader. Questions wafted through the air with the midges. Discussions centered around the fly(ies) of the day, casting, adjusting the depth of flies, and reading the fish finder to determine boat position. Unlike most of my experiences on Crowley, conversations went on uninterrupted. The fish were there. Willy hooked a couple of decent rainbows early in the day, but strikes were few. Bill landed a nice brown later in the day, as did I. Violating the rule about moving away from fish, we did, wetting our lines at Green Banks, near Leighton Springs and Alligator Point, only to end up back at McGee. That learning was put to the test Thursday, when Willy and I spent the day in his boat, searching for open channels and properly positioning the boat. Eight hook ups, with one beefy brown to the net and three rainbows lost — big fish that jumped and cleared the water by a body length or more — suggested we’d done well. Day two entailed my learning how to launch a boat on a rather shallow ramp, and soon enough we would be on the way. Unlike the previous morning, a nice breeze rippled the water; perhaps the same breeze that pushed the top-water algae to the opposite side of the lake. It was one of those clear, crisp high Sierra mornings when the mountains seem that much closer. Willy and I had discussed strategy while slowly cruising through the marina with a probably misguided reliance upon my previous experience — five years worth — at Crowley. We’d end up agreeing to revisit the McGee Creek channel, but with my suggestion, which had no basis in any empirical evidence, that we’d push closer to shore and fish in about 10 feet of water. A few boats and float tubers were already in the vicinity when we both began to carefully watch the depth finder for the edges of weeds and the telltale dip of the creek channel. We crossed it a few times and when we finally anchored, it had taken longer to get into position a few feet away from the channel (so we could cast to it) than it did to make the run from the marina to our destination. We were set to cast. I felt a bit of a dorky tingle as I locked forceps to my bottom fly — I’d seen guides do this, but never myself — and lowered it over the gunwale to gauge the depth as which to set my indicator. I nervously cast out to where we hoped to intercept cruising fish; thinking that this was a test that would be graded by the fish we landed, or didn’t. As often happens on this lake, it wasn’t too long before Willy’s indicator went subsurface. Once the hook was set (and the fish obviously felt it), a big, beautiful rainbow cleared the water by a body length of at least 18 inches, if not 20, and threw the hook. Willy and I gawked at each other in disbelief. For me it wasn’t so much because Willy didn’t land the fish, but for the simple reason that this fish clearly demonstrated that we, on our own, had done something right. Willy would hook (and lose) another big rainbow later than morning, and we’d both elicit strikes when raising our rods (and flies) to cast, with one fish hitting Willy’s fly just a few feet from the boat. There were a few other fish for me, including one huge brown…not long, but linebacker big, with shoulders and a head big enough to give me pause before reaching into the net. It wasn’t the wide-open fishing, or even the hot and heavy fishing, that I’ve previously seen on Crowley. It’s not always a numbers game and the difference this time — a huge difference in fact — was that we did it on our own and that the fish seemed to agree that we did something right. 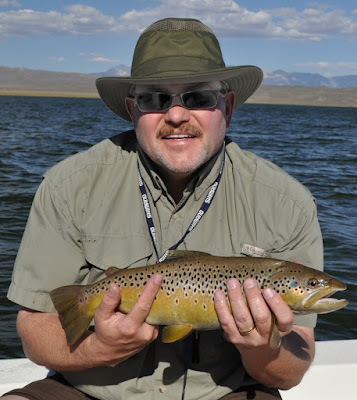 Categories: Brown Trout, California, Crowley Lake, Fly Fishing, Rainbow Trout, Vacation & Travel | Tags: Crowley Lake, Diablo Valley Fly Fishermen, fishing, fly fishing, Sierra Nevada, stillwater fly fishing, trout | Permalink. Great journey of self discovery and some nice fish hooked and some apparently landed (thick brown, BTW)! Question: after lowering them into the water, did you get your forceps back? I assume so, but it wasn’t made clear. A lot of forceps are lost that way, to be sure, but the most unique being a guide, while filming for a proposed television series, had a fish take his top fly, leaving him to hand-line in a decent rainbow. Just wish I could find the video online… I did get mine back, but I did make sure to use the free ones obtained in a giveaway at a club meeting of medical forceps and scissors. And yes, that was one mean looking brown!